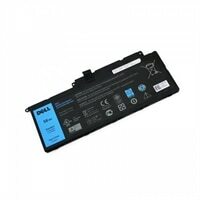 Dell 56 WHr 4-Cell Lithium-Ion Battery with ExpressCharge, Customer InstallAlways on the go? No more worries about running out of battery power! You can power your Laptop with this 4-Cell Lithium-Ion Battery from Dell™ . With a capacity of up to 56 WHr, the battery lets your laptop work seamlessly when you are on the move. Genuine Dell-branded parts undergo rigorous testing by qualified engineers to ensure compatibility and reliability in your Dell system. Our sustaining qualification process allows for testing and certification of the newest technology on your Dell system. Dell uses only OEM grade quality components. Genuine Dell-branded parts mean that you will not need to worry about voiding your system’s hardware warranty. Non-Dell parts are not covered and may void your system warranty. Our experienced technical support staff is available to answer any questions regarding your genuine Dell-branded parts upgrade. Parts purchased from other sources will not be supported by Dell. Always on the go? No more worries about running out of battery power! You can power your Laptop with this 4-Cell Lithium-Ion Battery from Dell™ . With a capacity of up to 56 WHr, the battery lets your laptop work seamlessly when you are on the move.